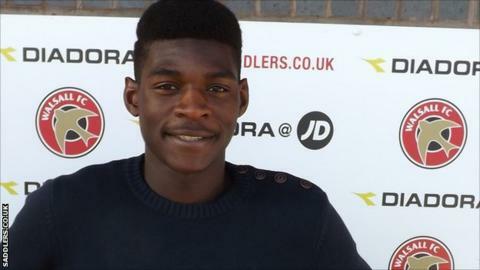 Teenage Walsall striker Amadou Bakayoko has signed a new deal with the League One club. The 19-year-old made eight substitute appearances for Dean Smith's side in 2014-15, in addition to a loan spell at Conference side Southport. "I'm happy to have signed this new contract," the Saddlers youth-team product said. "I can't wait for pre-season to start now so that I can get back down to work and show what I can do." Bakayoko scored his first professional two goals while on loan with the Sandgrounders, and found his way into the Saddlers first team following his return in January. The deal follows that of Kieron Morris, another promising talent to have committed to the club after a successful loan spell, at Wrexham. "It benefitted me to go out on loan last season; to play regular, competitive first-team football certainly helped in my development," he added. "I only have to look at the progress that Kieron Morris has made to act as motivation."